For 2015 year end holiday, we were in Sydney for about 25 days. Out of this, we spent 10 days in Tasmania. There were 7 all of us on the Tassie trip. We flew to Launceston from Sydney instead of Hobart due to its distance and price. To move around on the island, we booked a car from Avis. For such a big group, we needed a car called people mover. We were given a Hyundai Imax. 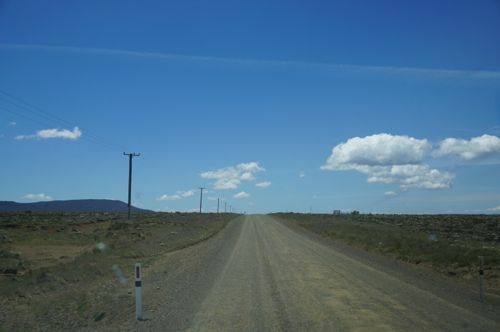 For this road trip, our plan was to go around the island clockwise – starting and ending in Launceston. 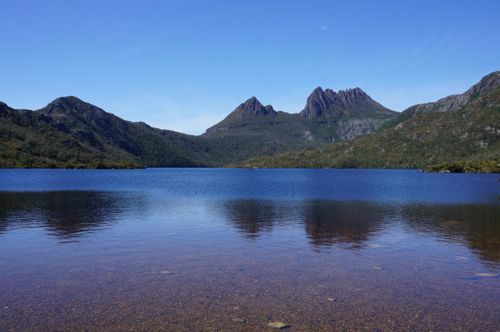 We had pre-booked our accommodation before we went there – starting with Launceston, then Bicheno, Huonville (Hobart), Cradle Mountain and Penguin. The best thing about Tasmania is the public toilets are free and so is the highway. We find out that the cleanliness of the island is top notch. The Tasmanian people are friendly and helpful. Right after we settled our stuff, we went to a nearby town called Kings Meadows for a quick dinner. Clueless and not sure where to go, we settled at KFC. After dinner, we went to Woolworths for grocery shopping. Stuff we bought were ingredients for breakfast and dinner. 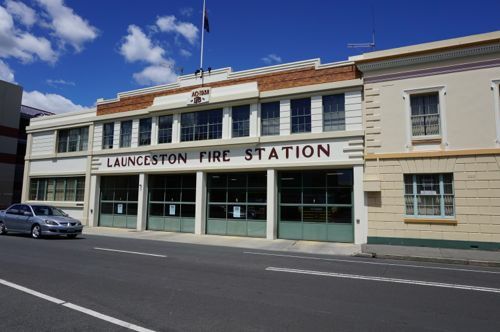 The temperature in Launceston was cold, about 15 degrees Celsius. 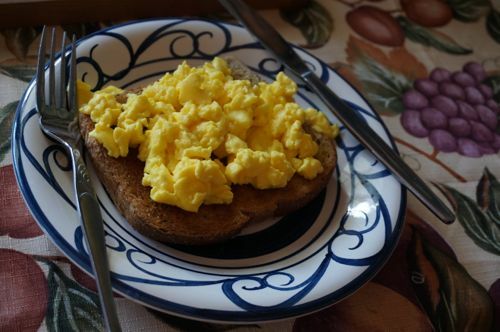 We made our breakfast in the morning from what we bought from Woolworths yesterday. 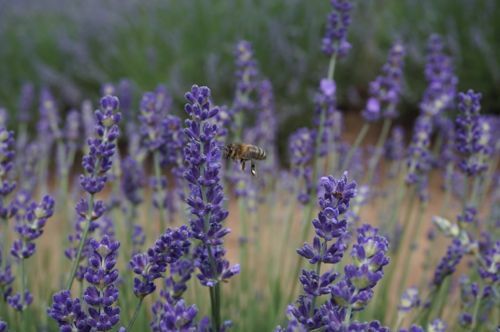 The first destination of the day is Bridestowe Lavender Estate (established in 1922) in Nabowla. You can join a tour conducted by one of the staff if the time is right. 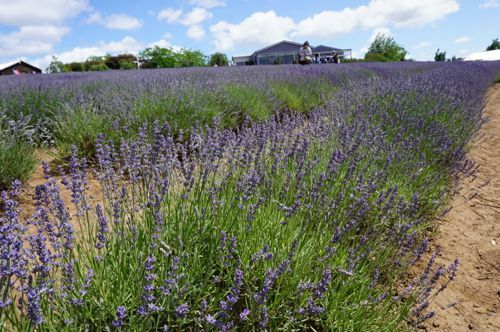 After the tour, you can sample its everything lavender at its cafe. 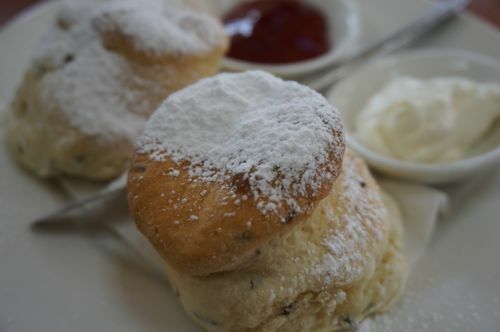 From ice-cream to scones, from muffins to coffee. To make things exclusive, each entrance ticket entitles you to buy one bear from the gift shop. Entrance fee is $10 per adult and free for children below 16. 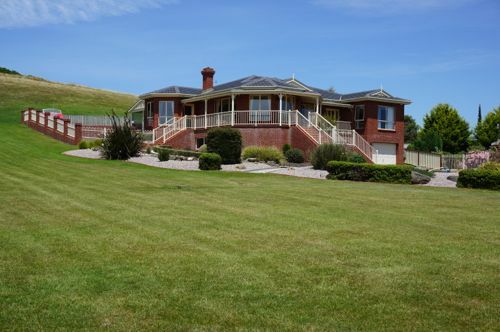 Address: 296 Gillespies Road, Nabowla Tasmania 7260. 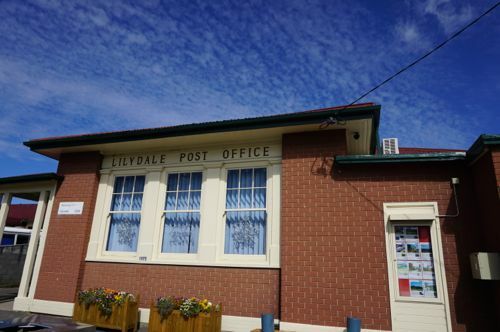 Before we reached the lavender estate, we stopped by in a small town called Lilydale. 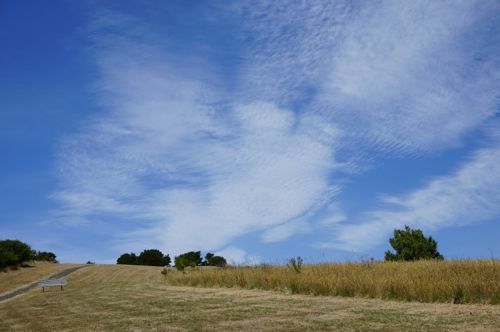 We stopped by at a nearby vineyard on the way back to Launceston from lavender farm. We made a random choice and picked Brook Eden Vineyard. Then we also visited another vineyard called Pipers Brook. 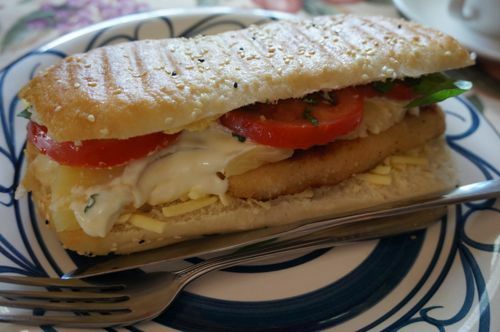 We stopped by Lilydale to fill up the fuel for the car and had our late lunch there. We then proceeded to Tamar Valley for a visit. 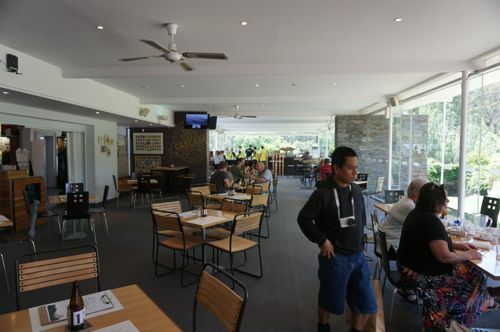 We stopped at Tamar Valley Resort for a short break before we continued with our journey. We cooked dinner at home. We went to Cataract Gorge in the morning. 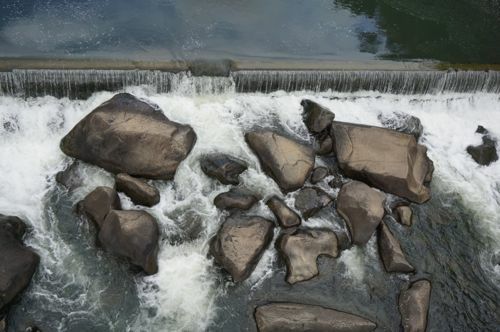 Cataract Gorge is synonymous with Launceston. 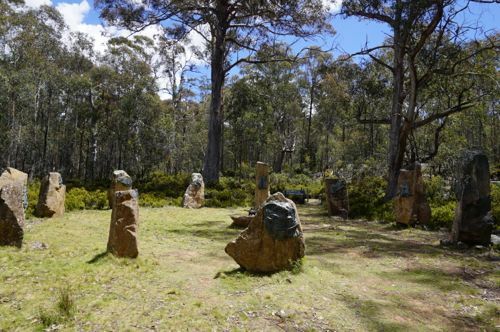 It’s incomplete to go to Launceston without making a visit to this gorgeous site. We parked near the entrance where the cafe is (Basin Car Park 2) and for 4 hours it’s $2.50. 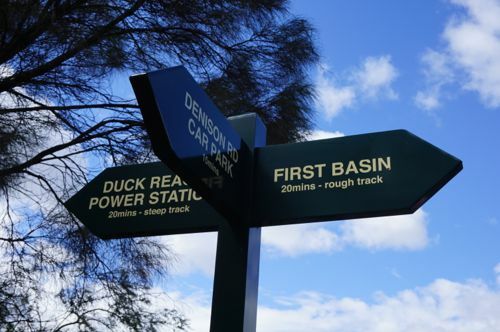 Cataract Gorge claims to have the world’s longest chairlift. 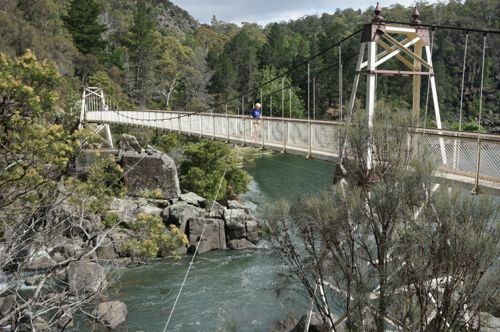 Cataract Gorge has a suspension bridge called Alexandra Bridge which was built in 1904. We hiked to Sentinel Lookout and back. It took about one hour for a return trek. The view is nothing short of spectacular. It’s just pure pleasure just indulge yourself in the stunning view. The place is well maintained and clean. Later we went to Queen Victoria Museum and Art Gallery (QVMAG). It’s a two-floor gallery (it has more floors but only two opened to the public). Free entrance. 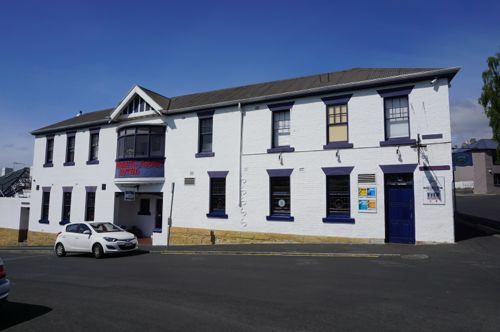 The art gallery is located on Wellington St. There’s a section next to the cafe that children can show off their creativity and skills with drawing and other activities. 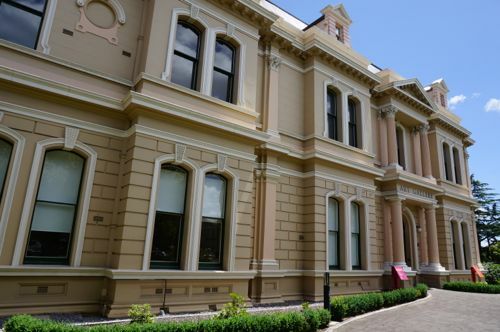 The museum is located at Inveresk, a separate location. Moving on, we took a walk based on a map called Historic City Walk. The route takes you to many old buildings that form part of the history of Launcestion. Our walk ended in City Park. On that day, it was too hot to continue our walk and we called it a day. 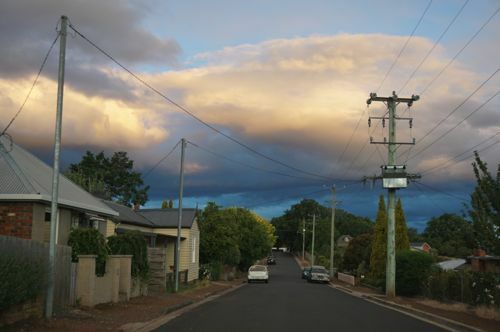 After self-cooked dinner at our accommodation, we had a car tour to Evandale town in the evening. A stunning but awkwardly quiet town. Over there, we saw some beautiful skylines laced with turquoise and blue and white. We went to Launceston Farmer’s Market which is located in the city centre on Cimitiere St Car Park. We got some cherries and raspberries. Also available there are coffee, veggies, sausages, other foodstuff. 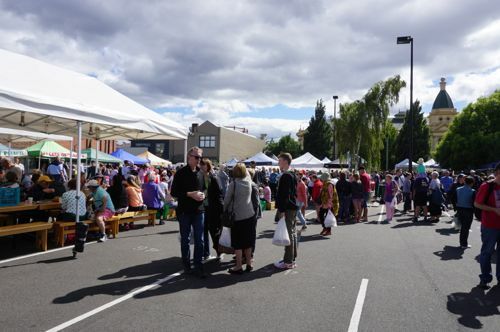 The market is on every Saturday from 8.30am to 12.30pm. We wanted to go to Lawrence House Museum on Castle St but we couldn’t find it on our GPS. In the end we gave up trying as it was too late for us to leave Launceston for Bay of Fires which is 2-3 hours away. 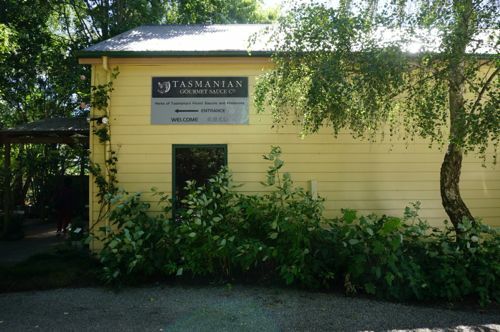 Before we headed to Bay of Fires, we made a quick stop at Tasmania Gourmet Sauce Co. near Evandale. The 20-year old company sells various types of sauces from jams to sauces. We bought a small bottle just to try it out. Free tasting available. Just make a request which jam and flavor you’d like to try. Before we reached Binalong, we stopped in St. Marys for lunch. 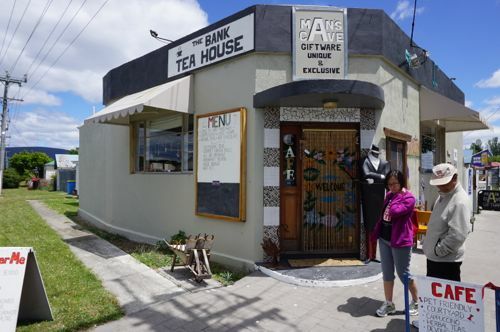 There weren’t many options and out of the couple shops that opened, we finally chose The Bank Teahouse. 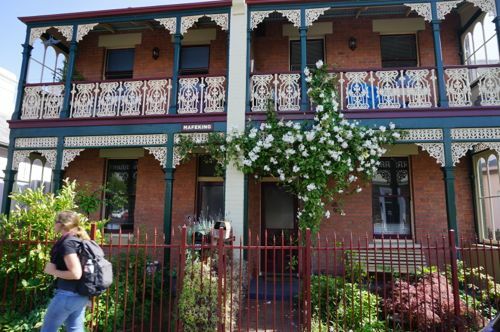 It turned out to be the right choice and when we spoke to the owners (a friendly couple from Queensland) about almost anything. In short, we clicked. The food? 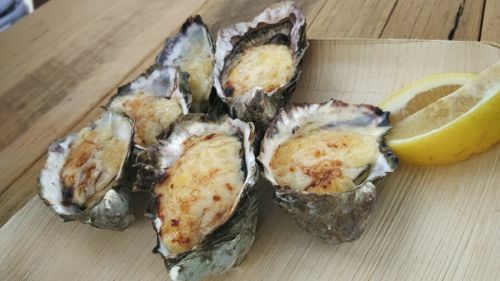 One of the best we tasted in Tasmania. Thanks Linda for the awesome lunch! 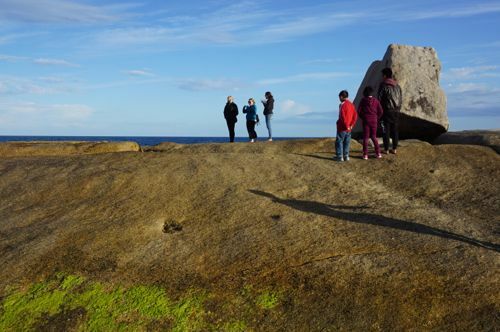 We visited Bay of Fires in Binalong. The view is fine but I personally feel it’s slightly over-rated. 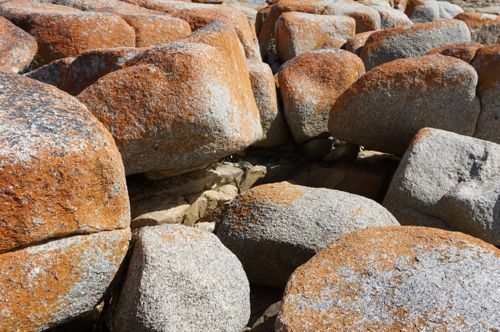 The place is full of stones with red marks on them that is caused by some kind of chemical reactions. 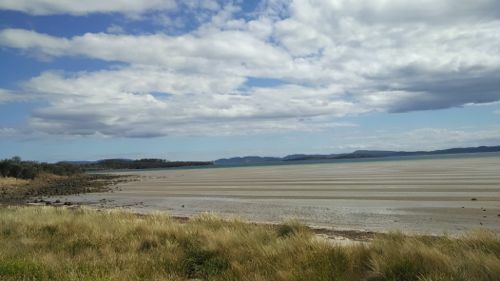 But what I must say is the beach (a strip next to the the “red” rocks) in Binalong is superb with white, powderish sand. 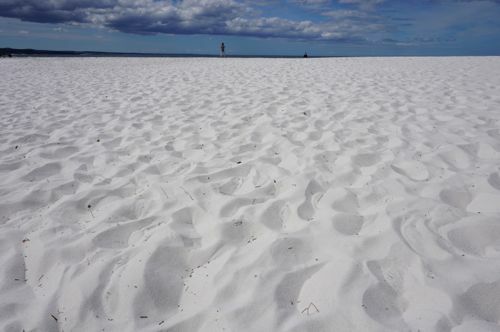 The sand is as fine as flour and as smooth as silk. 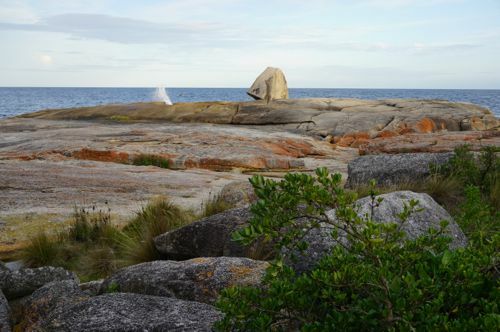 After visiting Bay of Fires in Binalong Bay, we went to Bicheno to check in our second accommodation. 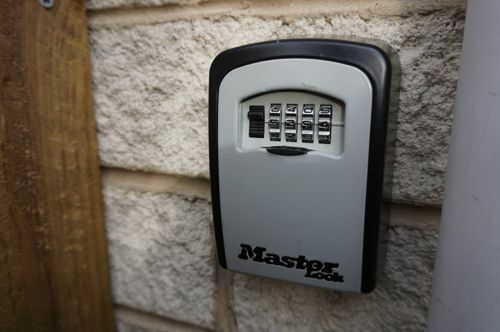 There was a bit of the situation as we didn’t have the passcode to access the key. And when we called the owner he didn’t answer the phone. We didn’t have Internet access and we had to call home to get someone to help us check my email to see if the passcode had been sent to me. Lucky for us, the code was sent to me 3 days before and I didn’t have time to check as I was busy touring around. The house is comfortable and cosy. 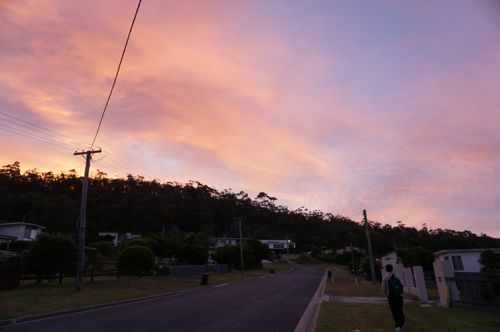 We had dinner at home and we had a car tour around Bicheno town which is surprisingly small. We went to the beach too. We went to Freycinet National Park first thing in the morning. Our destination was Wineglass Bay. 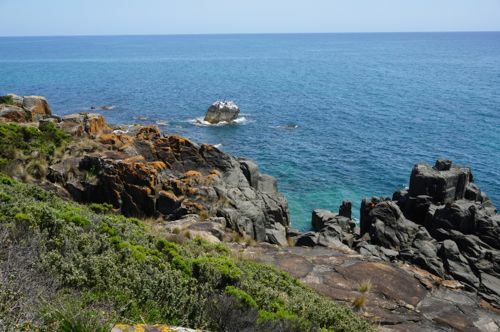 It’s 12 km from Bicheno. 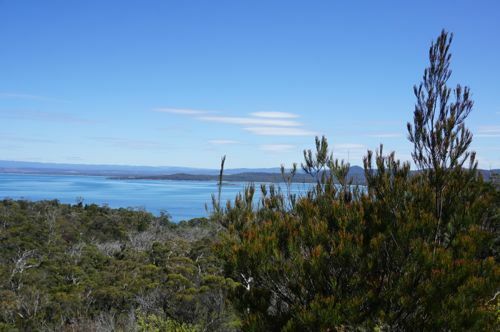 To reach Freycinet National Park you have to go through Coles Bay. 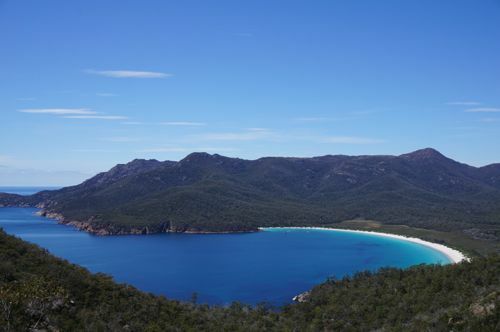 The Wineglass Bay is part of the national park. 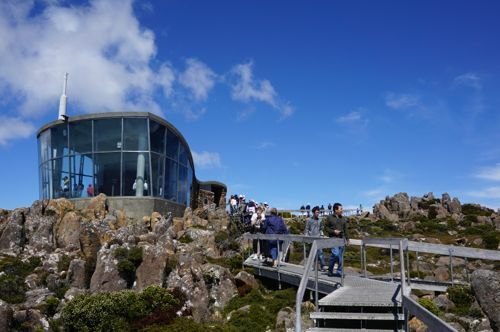 To access to the national park, you have to pay an entrance fee which you can purchase at the Visitor Center. We chose to pay by vehicle which costs $60. 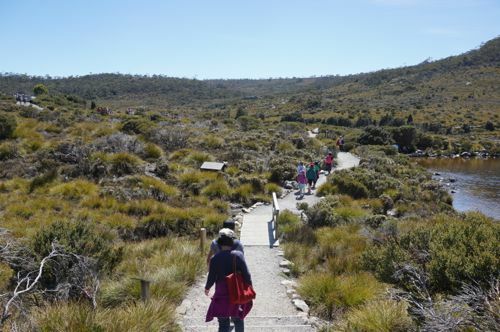 This entitles us to all national parks in Tasmania for two months. 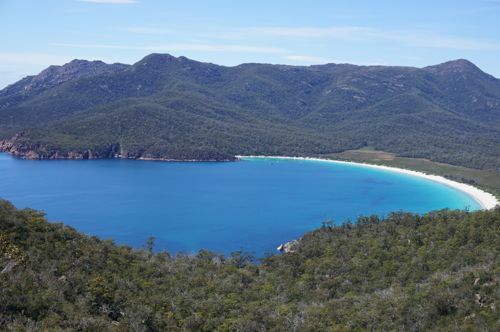 You have to hike for about 45 minutes from the nearest car park to Wineglass Bay Lookout point. 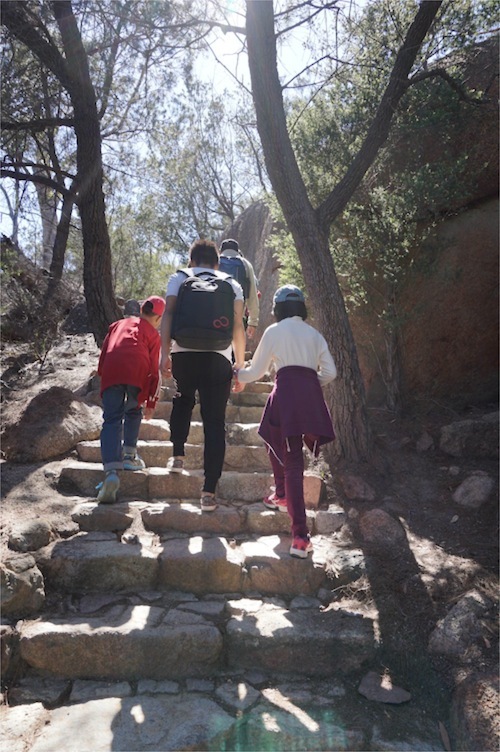 The hike is steep and it can be tiring if you are not fit. Don’t worry and take your time. But it’s worth the effort as you will be rewarded with a magnificent view. 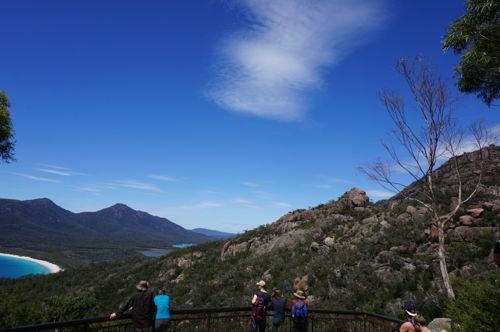 There are 2 lookout points along this trek: Coles Bay Lookout and Wineglass Bay Lookout. 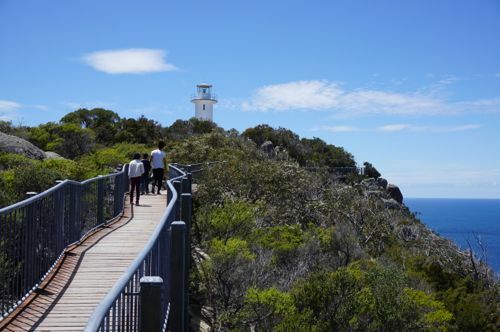 Another attraction in Freycinet NP is Cape Tourville Lighthouse, This one is easy. You can drive there and all you need is just 5 minutes walk on granite and broadwalk. The view is even more spectacular and the sea is very blue. We wanted to have lunch at the Freycinet Marine Farm but when we were there there happened to be a lot of Chinese tourists. We decided to return to Bicheno to have lunch. In the end, we ended up having lunch in the Chinese restaurant run by a chef from mainland China. We went home at around 3 pm and had a rest. 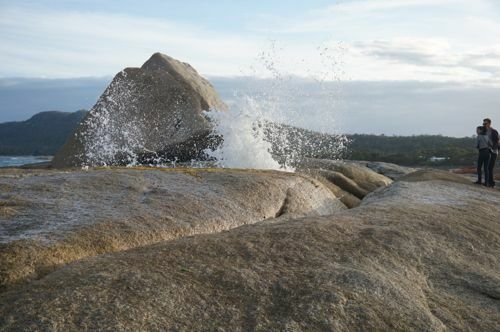 After dinner, we went to Bicheno Blowhole – which is only 5 minutes away from town. Before that we toured around the Esplanade and having fun looking at those beautiful beach front houses. We stopped at the first vineyard we saw after we left Bicheno on the way to Hobart. The vineyard is called Devil’s Corner. We had coffee and oysters there. 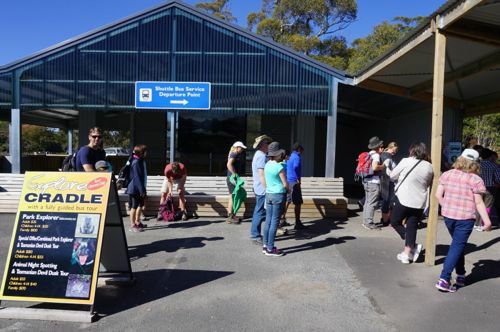 Apparently, the operator of the oyster stall is the same as the one in Freycinet NP. Later we found out that oysters are cheaper in Triabunna. 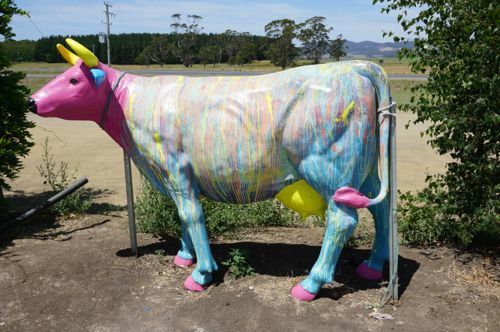 Next, we stopped at Kates Berry Farm which is located slightly after Swansea town from Bicheno. The shop sells all kinds of jams and honey. 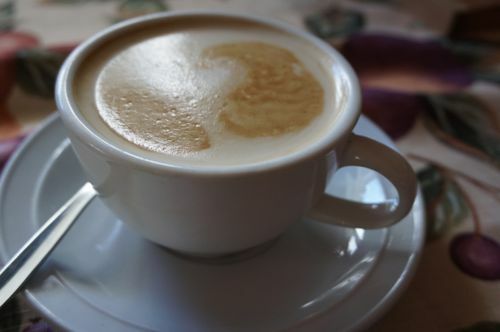 You can have a cuppa there to counter your sleepiness. 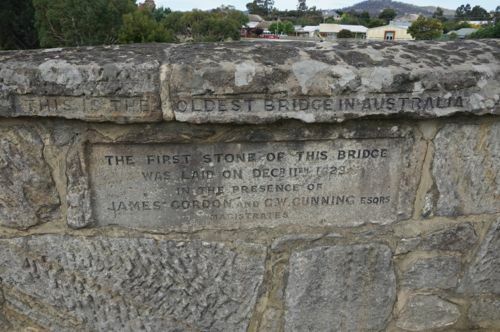 Further down, you will see Spiky Bridge built by convicts during the 19th century. We filled up our tank in Triabunna and had lunch at the Marina. We found a food truck by the sea and it’s aptly called The Fish Van. We ordered some fish and chips, seafood basket, and burgers. The prices are relatively cheaper here. 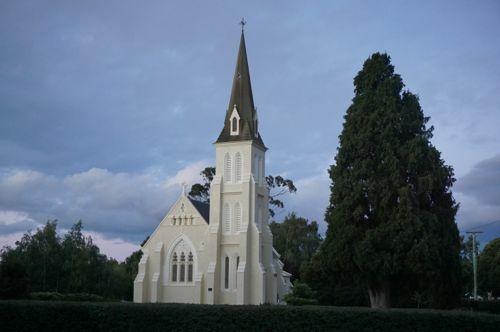 Moving on, we visited an old historic church in Buckland. 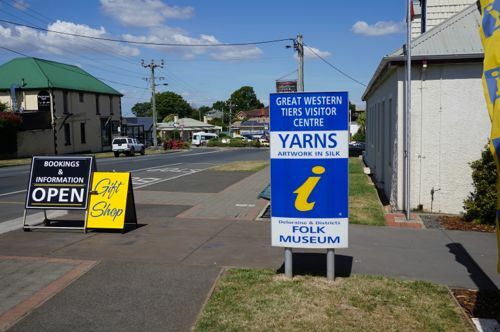 On the way to Port Arthur, we have to pass through Sorell. Right after the town, we saw a fruit farm called Sorell Berry Farm. J and K requested to pick the fruits there. $8 each child. You can pick any fruits that are in season until the container is full. Adults $14. 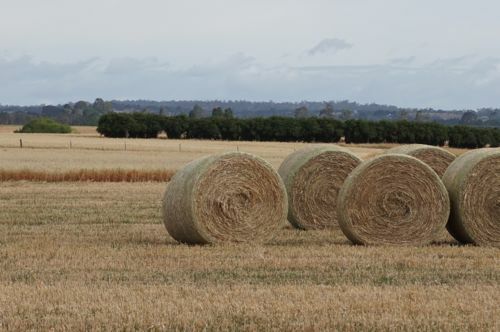 When we were in Sorell, we felt like we were back in civilization as we got to meet more people there. We didn’t expect this as we continued with our journey. We saw something extraordinary and we got to stop the car. The place is Dunally Bay Lookout. The view is fantastic. The beach looks like inter-layered peanut butter with jam. The view is so spectacularly unique. We didn’t go to Part Arthur Historic site as it’s too late and expensive. 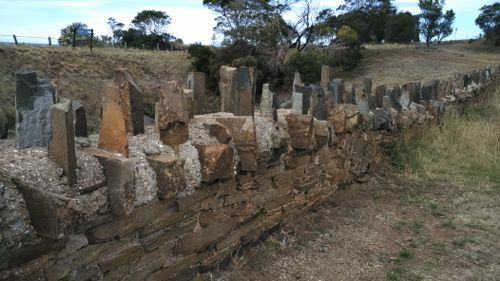 From a tip we got at the Visitor Centre, we came to know that there is another attraction which is not far from Port Arthur. The place is Remarkable Cave. It’s only 10 minutes’ drive from Port Arthur. You need to hike 5 minutes with boardwalk and the sight is stunning. If you have a chance, go there. On the way to Huonville, we stopped at a Chinese restaurant in Sorell for dinner. We didn’t know that it took about 45 minutes to reach Huonville and you have to go through mountains and valleys. The drive is especially taxing after a day’s of intense traveling. I lost today’s photos due to an accidental deletion. I was so frustrated but what else I could do other than be more careful next time. The photos on this day here are from my wife’s mobile phone. 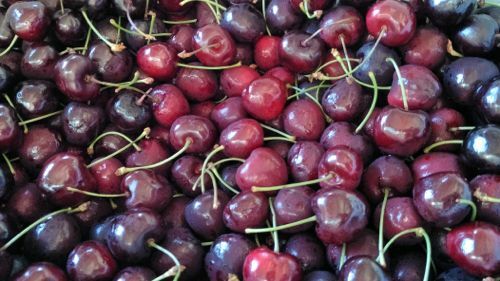 After a night in Huonville, the next morning we stopped at a berry farm called The Green Shed and all we wanted was to buy cherries. But the price is a bit high. $16 a kilo. Later on, we went to Mt. 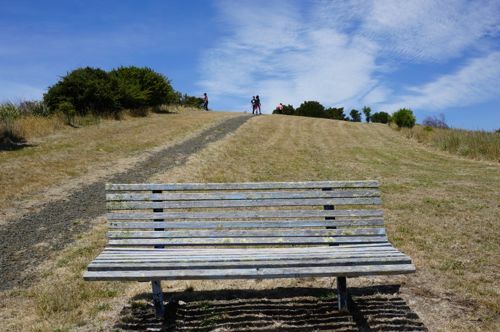 Wellington (1270m) – also known as Kunanyi. The turning to Mt. Wellington from Huonville is near where we stayed. But the road leading to the peak is winding in certain parts. And it took about 45 minutes to reach the pinnacle. 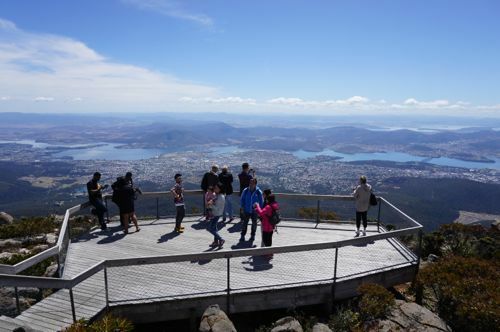 The view of Hobart from the mountain top is spectacular and breathtaking, to say the least. The place is well maintained and clean. This is a must-go. 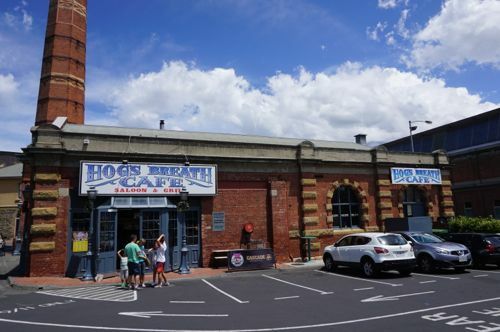 We were looking for a place to have lunch but my nephew told us Hog’s Breath Cafe is a decent restaurant. 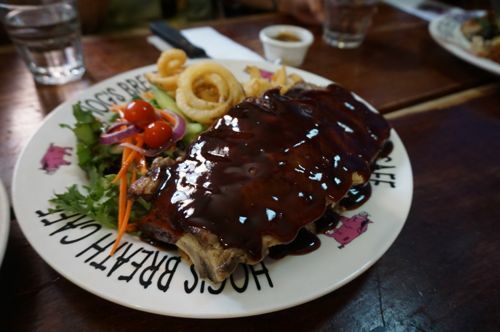 Since we have problem looking for a place to dine, we finally settled at Hog’s Breath. 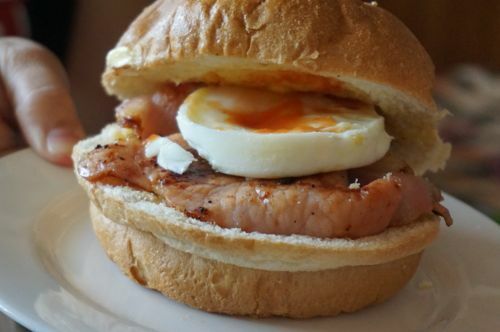 True to it, the food there is fantastic and mouth watering. We were a bit lost looking for places to go as my GPS was not “intelligent” enough. My GPS only works well if you know the exact address. We were looking for Cascade Brewery. 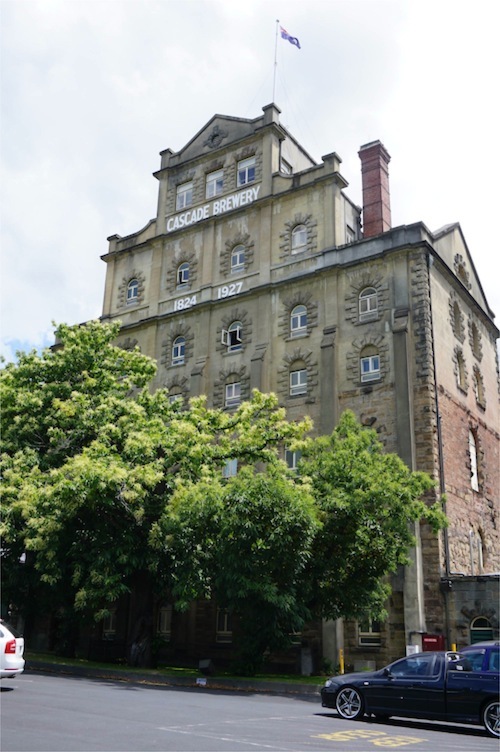 Finally I found the address in my research note and, from where we were, we were very near to the oldest brewery in Australia which was established in 1824. We didn’t join the tour but just walked around the cafe and the garden. We bought half a dozen Premium Light beer just to try it out. The garden is an excellent place to hang out. 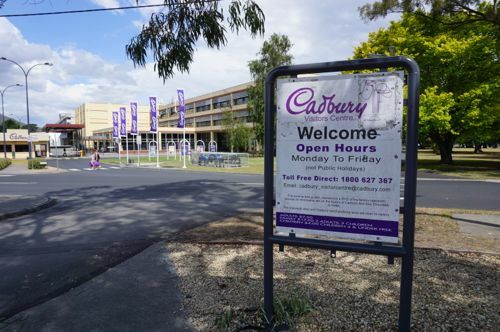 To please the kids, we went to Cadbury Visitor Centre in Claremont. It took us around 30 minutes to reach Cadbury from Hobart CBD. The shop closes at 4pm. 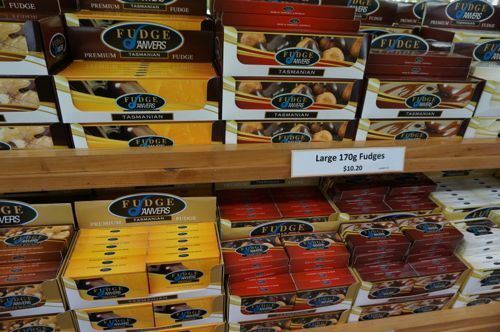 We didn’t join the tour but we grabbed a lot of chocolate products from the outlet. 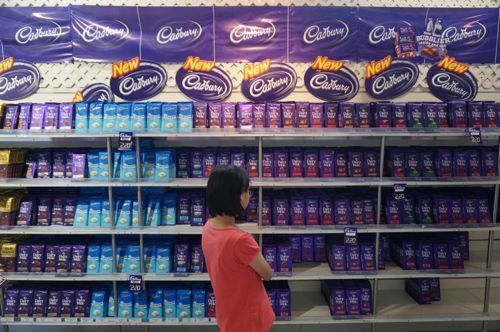 The prices are reasonably lower compared to other normal retail outlets. 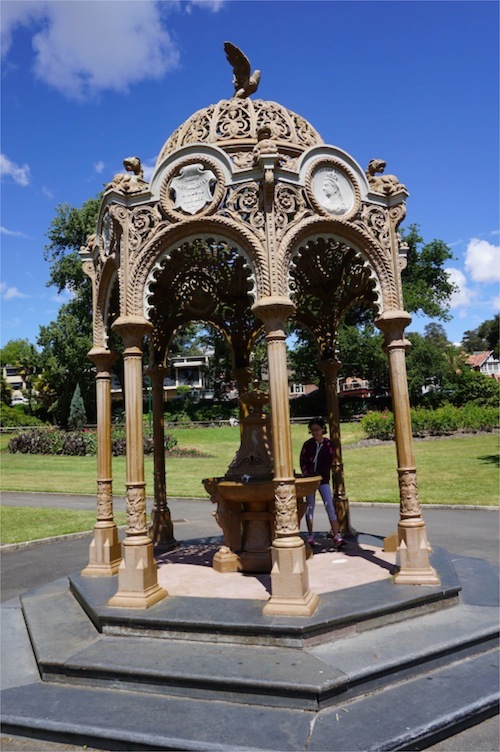 Next, we went to Richmond in the suburb of Hobart. It’s about 30 minutes’ drive. 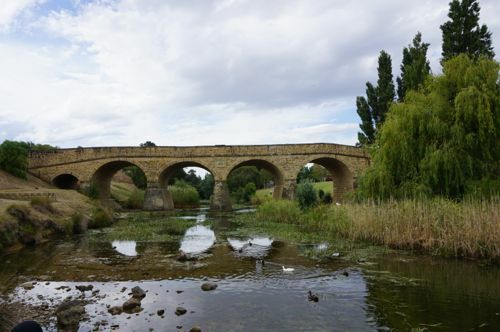 Over there, you will find some historic buildings that include the oldest bridge in Australia which was built in 1823 – the Richmond Bridge. We stopped by at Richmond Gaol Historic Site and the church. 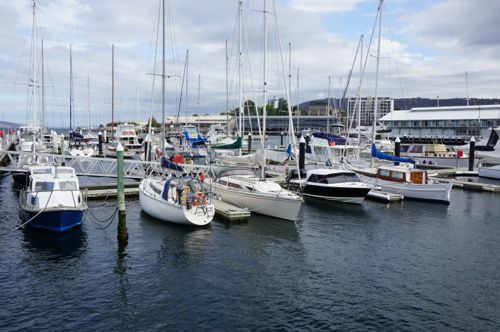 We went to Hobart Waterfront for a walk. The place is windy and scenic and you can find all sorts of yachts there. Later we were back in Huonville, a 30-minute drive from Hobart, to do some quick shopping for dinner and the following day’s breakfast. We had to say goodbye to Huonville and embark on a long journey to Cradle Mountain. Before we did, we went to Battery Point in Hobart. I love it and the neighborhood is full of nice and beautiful Victorian houses. 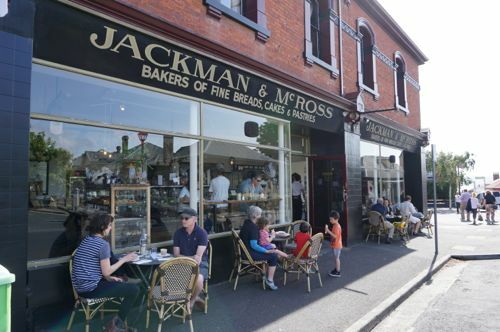 At the end of our walking tour, we stopped and dined at Jackman and McRoss. Why? Because many people say the place is famous for its pastry. 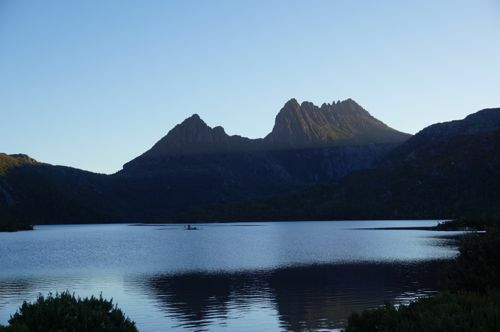 There are a couple routes we could take to Cradle Mountain from Hobart. We had decided to take the Great Lake Highway by going through Bothwell, Miena, Deloraine, Mole Creek, Sheffield. On the way, we stopped at The Steppes Stones which consists of sculptures of various animals in the middle of… nowhere. 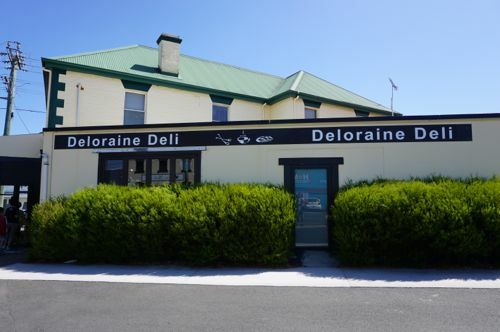 We reached Deloraine at about 2pm and we had late lunch there. We had a little problem here. I realized I lost my mobile phone while at the restaurant and we spent 2 hours looking for it by backtracking as far as a round trip of 2 hours’ drive. We told a policeman at Deloraine police station about the loss. Later we found the mobile when I looked for the phone for the second time outside Deloraine Visitor Centre. It was hidden by the plants near the pedestrian walkway. It was a mixture of excitement and tiredness at that moment. We drove for 8 hours including the phone search that day. 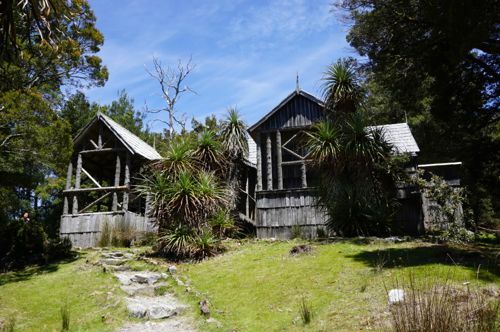 It took us 1.5 hours to reach Cradle Mountain from Deloraine. We saw some wild animals along the way to Cradle Mountain as the sun set. The staff left the key in a box and we helped our as we reached late in the evening. The place where we stayed Discover Holiday Parks is too cramped and the bunks are too narrow and low. The only good thing about this place is free wi-fi at the reception counter. 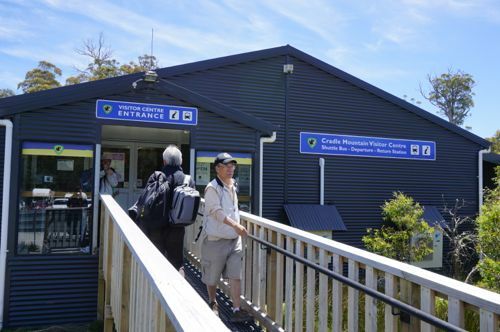 You can choose to enter Cradle Mountain National Park for the multiple walks by car or by shuttle bus. The shuttle bus service is provided free after you purchase the park entry pass. 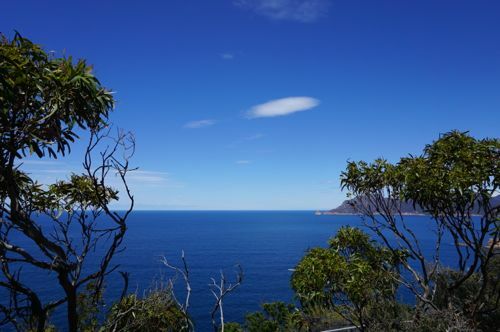 We bought the passes at Freycinet NP for a car that is valid for 2 months. 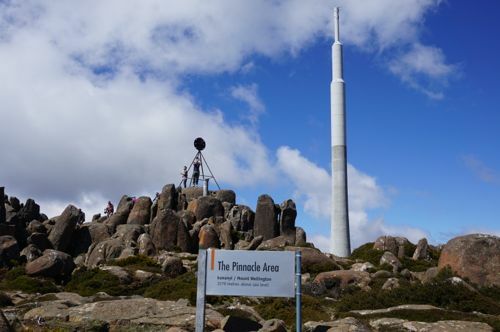 That pass can be used in all national parks in Tasmania. The shuttle bus service runs until 6 pm and you can take one at the Visitor Centre. 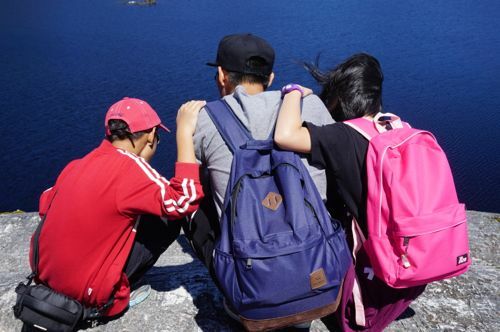 And the furthest spot to reach by a bus is Dove Lake. You can hop on and hop off the bus as and when you like. 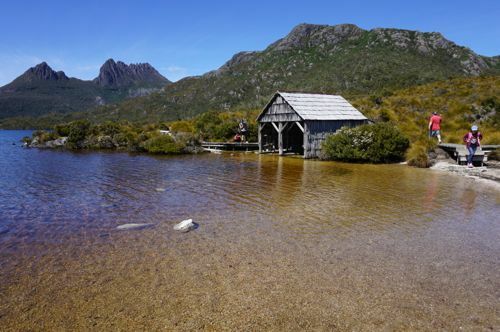 There are many walks you can take in Cradle Mountain – ranging from 20 minutes walk to 2-3 hours to a few days. When we were there the sun was glaring and bright. 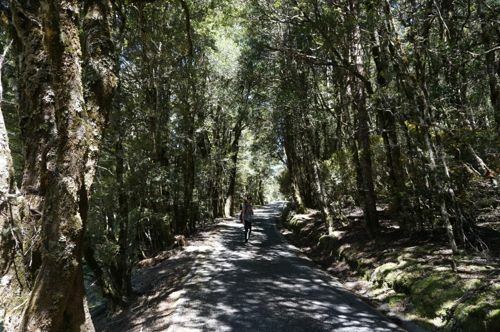 Since the Dove Lake track is not sheltered by big tall trees, it was very hot then. However, it’s the best day to take photos. We only went to the Boat Shed and and the Glacier Rock. The views are stunning and not to be missed. Then we took the shuttle bus to Ronny Creek and to walk to the more shady Wardheim Walk. We stopped at the Picnic Hut for a simple lunch. Nearby there’s a replica of Gustav Weindorfer’s original chalet. In the afternoon after a shot break, we went to Wilmot Power Station and Round Mountain Lookout which is about 30 minutes from Cradle Mountain. 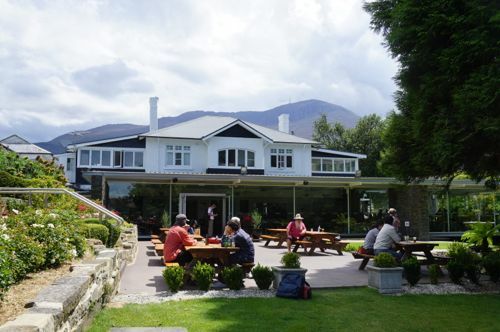 Then we visited Cradle Mountain Hotel and its art gallery which is located behind the gift shop. Later in the evening after dinner at about 8 pm, we drove all the way to Dove Lake Stop and checked out Cradle Mountain in the evening. It’s still stunning but the mood was different and it’s less hot. The sky was still not dark yet. As we drove along on the way out at around 9pm, many wild animals were spotted especially wombats and wallabies. J and K got extremely excited with the animal spotting. 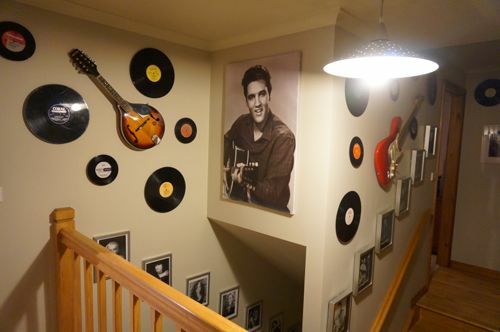 We left Cradle Mountain and for the final night, we stayed in a small town called Penguin – which turned out the be the best stay for the whole trip with its nicely decorated music-themed house. 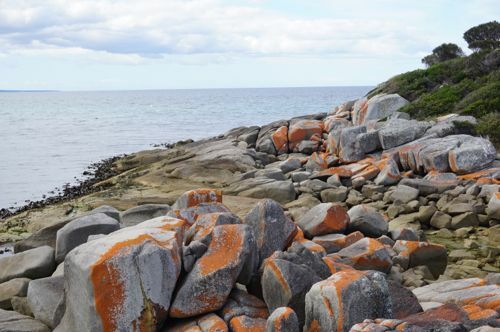 We decided to go there from Cradle Mountain through Wynyard – a coastal town in the north-western Tasmania. To our surprise, we had had a few surprises there. After filling up our stomachs, we headed to the Visitor Center and asked for local attractions. 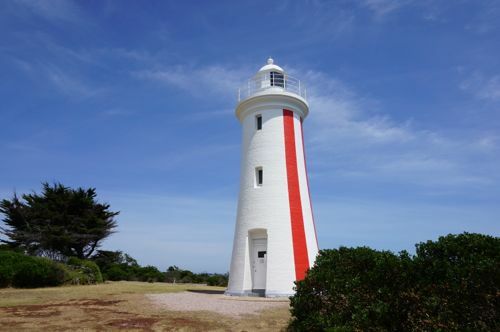 The person there recommended us to go to Fossil Bluff and Table Cape Lighthouse and Lookout. We didn’t go to Fossil Bluff but the Lookout. It was very hot then so we just made a quick visit there. On the way, we found some surprises. 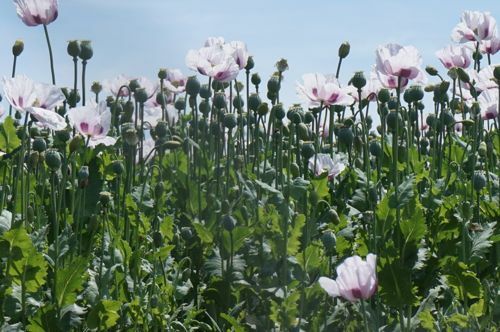 We saw some poppy flowers and pyrethrum. 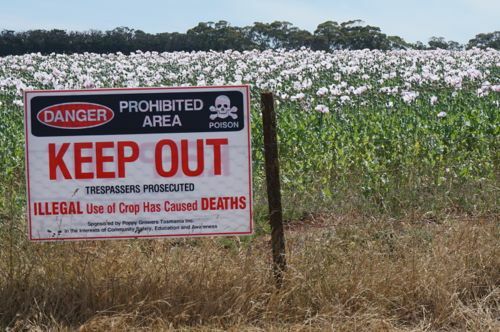 Later we only read that Tasmania is the only state in Australia where you can legally plant opium poppies. The fields look amazingly beautiful. And for the first time in my life, I saw a wheat field there. My wife read in the last minute that we could see penguins near where we stayed. And the best thing is it comes with a free guided tour. 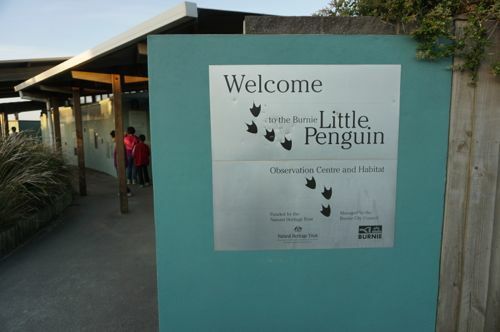 We inquired about it from the house owner and true enough, the penguin watch is just located in the next town called Burnie. 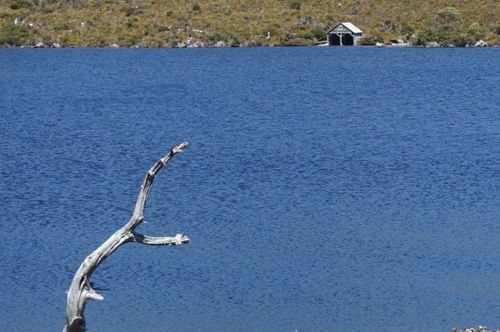 It’s about a 20-minute drive from Penguin. Armed with the map from house owner, we embarked on the adventure. Penguins are coming home from sea to feed the babies on the shoreline when it gets dark. 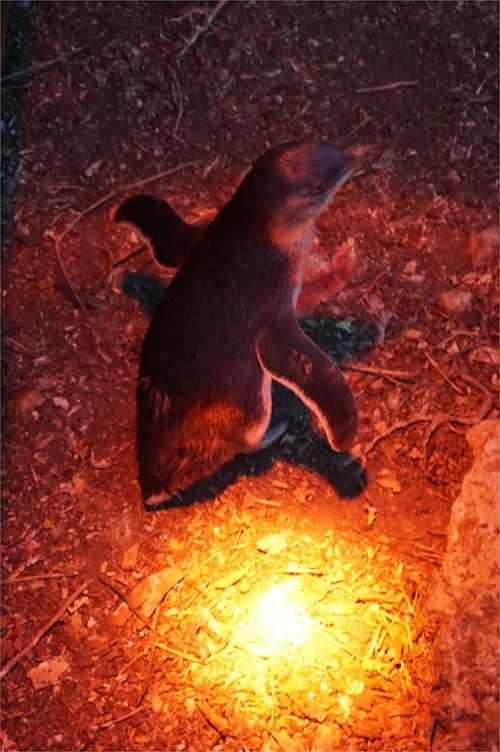 We spotted the first adult penguin coming home at about 9.30pm. It was quite an experience as we got the chance to look at penguins up close. K was especially excited. Not wanting to regret not having enough cherries while in Tasmania, we made a final attempt to buy more cherries on the last day. 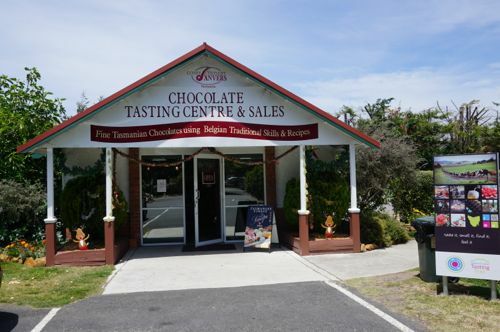 We went to Danker Cherries in Ulverstone (it’s located in the outskirt and you might need a GPS to locate it). It’s a family-owed farm and the service is excellent. Cherries were $10/kg. Fresh and juicy. Love them! Then we drove to Devonport from Penguin and Danker Farm. We didn’t know what to do or see but we had one secret weapon: visitor centre. Based on the recommendation from there, we went to Mersey Bluff Lighthouse and Lookout. 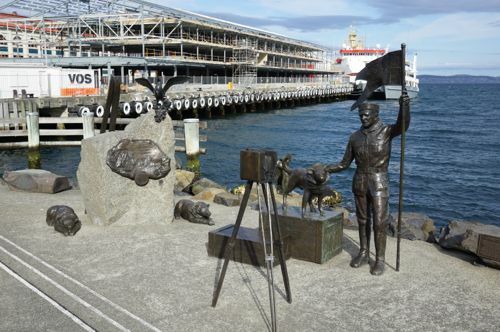 Devonport is home to Spirit of Tasmania – where ferries from Melbourne ply. 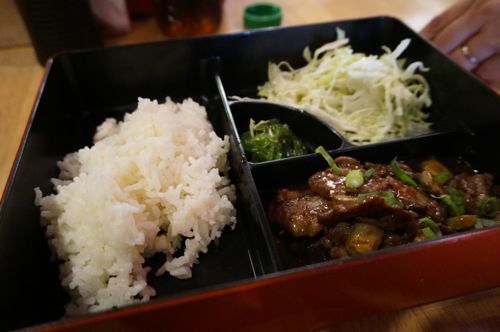 We had Japanese lunch in Devonport. It was cheap and fabulous. After lunch, we headed to Latrobe. 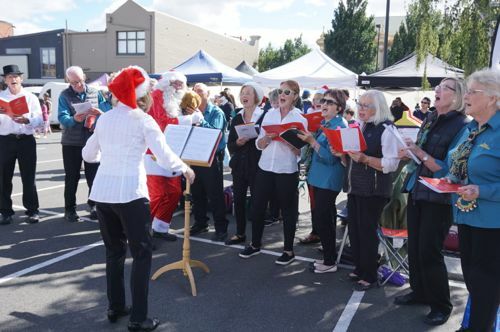 Again, from what was recommended, we went to Bells Parade. Bells Parade is nothing more than a park and a river in which you can swim. We didn’t get down. 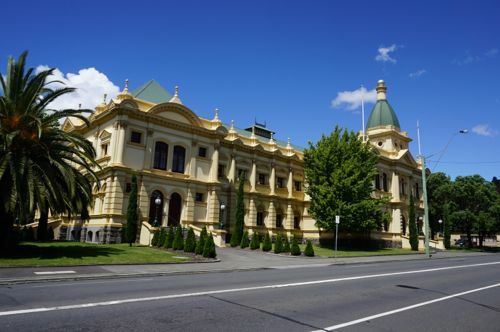 We went along Bass Highway and our final destination is Launceston. Along the way, we stopped whenever we saw some interesting attractions. One of them is Anvers Chocolate Factory. 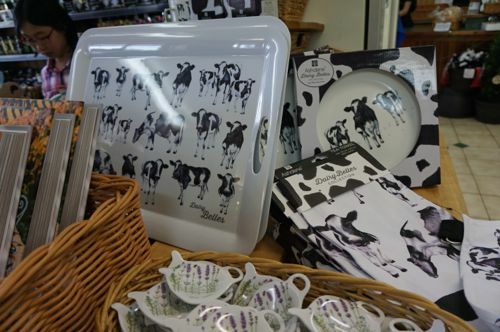 There are a shop, a cafe and you can even view the factory through glass window for free. The cafe must be popular as I could see it was full of customers. 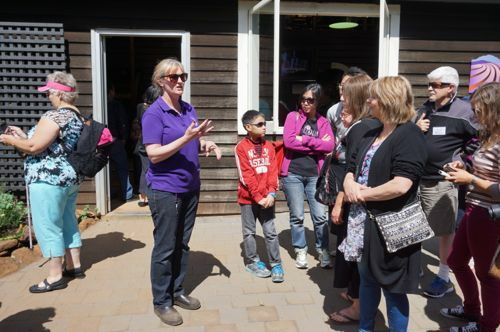 We then went to Ashgrove Tasmanian Farm. 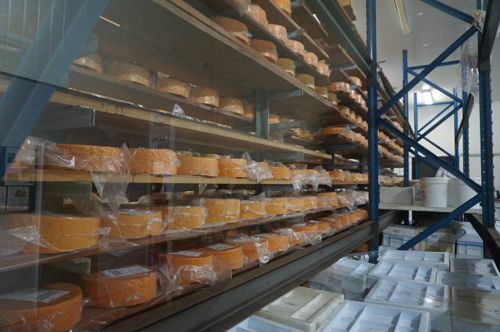 Again, they do have a cafe, a shop and open for viewing a section of their cheese factory. We tried the coffee and ice-cream there and they were both fantastic. 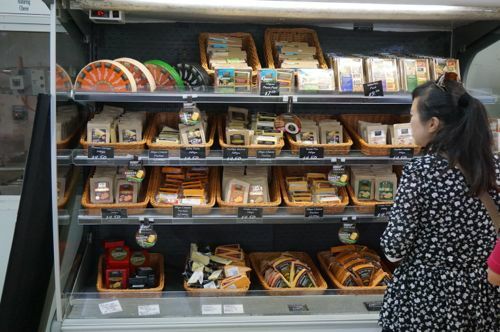 While you are there, don’t forget to have free tasting of various types of cheeses. We had a quick early dinner before taking a flight back to Sydney. That was one hell of a vacation. 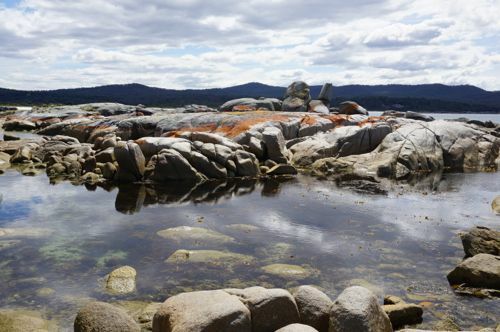 Tassie is great for people who love outdoors and natural wonders. 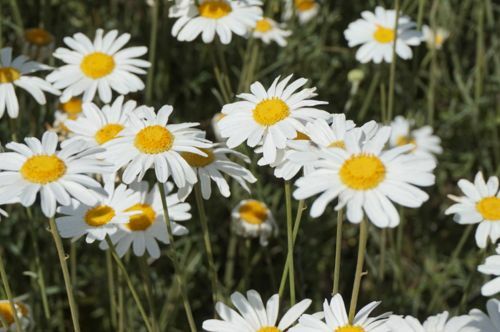 We had seen them all: the beaches, sea, lakes, mountains, caves, buildings, bridges, lighthouses, food, beer, chocolate, flowers, wild animals, and of course, the sunlight. All in Tasmania.